Q. Can you give me some pointers on how to make my horse less herd bound during trail rides? If I decide to turn around and leave the riding group, or the riding group leaves us, my horse gets frantic and tries to run back to his friends. A. Try not to get frustrated or mad when your horse gets frantic. He is simply relying on his instincts to stay with the herd where he feels safe. Prepare your horse ahead of time for these separations and try not to put him in a “sink or swim” situation. • At the start of every trail ride (whether I am with one other rider or in a group), while we are walking, I ask my horse to stay back a few horse-lengths. I allow him to catch up and then ask him to stay back a little farther. I establish my leadership role at the beginning of the ride, and I make sure my horse can handle these small separations. Don’t wait until you have ridden several miles to find out that your horse is going to “lose it” if he gets separated or behind. • Leap frog: Start by riding with only one other rider—a good friend on a trail-savvy horse is best. Make an agreement that the goal is to help your horse. 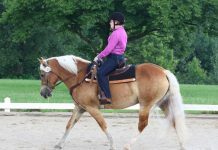 Ride on a trail that your horse knows, and start the training at the walk. Take turns passing the other horse and rider: When your horse is in the back, ask him to drop back a little (a few horse-lengths at first), then allow him to catch up and take the lead. Gradually increase the distance and length of time your horse can comfortably stay back. This may take many sessions. When he is good at the walk, try it at the trot. If your horse gets anxious, go back to the distance, length of time and pace he can handle and try again. Add more riders and new trails as your horse gains confidence. • Out and back: During this exercise, one rider turns and rides in the opposite direction (or off on another trail), away from the other horses. Then that person turns back and joins the group. Start with small separations and increase the distance and time apart. 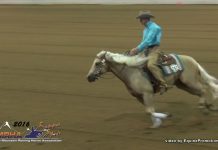 • Watch ‘em work: For this lesson, one horse at a time leaves the group (a short distance at first) to go to “work.” The “working” horse is going to be busy doing his “job” while the other horses that are left behind get to rest. Here are some ideas for “jobs”: trot in a circle around a tree; ride a figure eight around two rock piles, bushes or trees; side-pass down the trail and side-pass back; jog or lope away from the group and walk back. Start with an easy job and slowly increase the difficulty. The goal is to have the working horse calmly doing his job away from the herd while the other horses stand quietly. Expert: Traci Falcone has completed more than 4,000 miles on endurance rides, including four Tevis Cup “100 Miles in One Day” rides. In 2004, she rode Tevis completely bridleless. Great article! I have these issues with my horse…but it happens at horse shows.